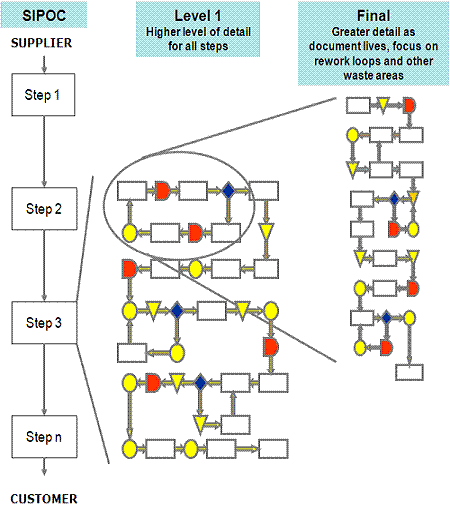 Process Maps are detailed flow diagram of the process using color coded symbols that drill further into the high level map generated on the SIPOC. The purpose is to visually represent the process as it is in reality. Complete the current state map by walking (GEMBA walk) and experiencing the process. This is a valuable learning experience, the team will quickly gain insight about the actual flow. Don’t sit in a room and think it through yourself or with the team. Patience, time, asking questions are all part of the completing this map. Create a current state and a future state. Your team may want a future state with a short term target (such as 90 days) and a long term ideal state. To capture all the complexity and improvement opportunities by analyzing each step in detail. Seek out the 7-Wastes and enhance current value-added activities. These represent opportunity for waste elimination. Proceed with the goal to eliminate waste before settling for waste reduction. Throughout the entire process map, look for the 7-Wastes. So, before process mapping, educate the team on how to "see" waste. Take caution when considering "automation" to take over manual processes. People are adaptable and much more flexible. Automation is fixed, constant, and often difficult to fix and maintain. In a JIT environment the decision to automate is advised with caution. The following list of are key elements of a process map. The current state map may lack some of these elements. More importantly, is to consider these elements in the creation of the future state map. It is meant to be reviewed and updated on a continuous basis. The more detail it contains, the better understanding you and the team will have of the true process and opportunities. It's considered a living document. There are clear START and FINISH steps. Clear bookends. A Process Map should have an overall Owner. Metrics defined to show the future state improvement. Ability to stand the test of time (new hires, people changing roles, etc). Ability to be achievable and realistic. Clear connection points and hand-offs. Accommodate some of the what-if, or unique scenarios. Not all processes will follow a particular path all the time. Try to map the most common alternative paths and improve those too. A good process map gets the process from the 50,000 foot level to the ground level of the actual process. The development of the map is a team effort and it will educate everyone on the reality of the process and most often how little of the total process is value added. Typically, there are obvious improvements that will be become evident while the mapping is being done. It will not be perfect the first time through, add more detail as it evolves. It is important to remain with the Start and Finish boundaries set forth by the SIPOC in the DEFINE phase. The team needs to begin identifying the value added steps versus the non-value added steps and time. This realization is clearer during Value Stream Mapping (VSM) that adds more quantification to the steps. Creating a future state or ideal state (while being realistic yet not too limited) will make it clear to the team that everything getting in the way is opportunity to improve. Laws, regulations, customer standards, past paradigms all need to be challenged because they change over time. Creating a process map on a computer is common and many software programs exist that have symbols created. However, the first drafts are often very complex and frequently revised. Create the real flow on paper and post it publicly for others to offer input and critique. It is very important to catch the rework loops, communication issues, decision delays, stops, starts, pick-ups, drop-offs, and other waste so the team fully understands the opportunities. These hidden factory "what-if" and "sometimes" paths are important for everyone to document and understand. This knowledge will create better subjective decisions when assigning weights to the inputs using the subjective root cause analysis tools in the Measure phase. Rework loops are where defects and wasted time are occurring. The team should focus on preventing them, reducing their severity, and detecting them if they can not be eliminated. Some product or process may actually go through the rework path multiple times and the map does not illustrate this unless specially noted and discussed. 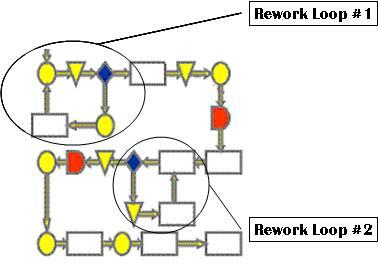 The picture below shows two Rework Loops. Rework loops have varying severity. The process map does not show the amount or cost of pieces scrapped or the amount or cost of pieces reworked. Use the yield calculations to get this data. Often a Rolled Throughput Yield (RTY) is calculated to help quantify the scrap and rework through these loops and this does not always mean the lowest RTY is the worst financially or to the customer. If one type of rework is more expensive or higher risk to the customer (such as a delayed delivery), then it may be a higher priority to improve. This is all going to shake out in the subjective root cause analysis tools and the inputs get funneled out to the most important, key process input variables (KPIV's). Insurance companies will often use flowcharts to identify hazards or perils that could result in exposure. Flowcharts should also be used by the team to evaluate ideas to reduce these exposures, similar to reducing the severity, occurrence, and detection of an input within a FMEA. Risk managers often use them along with questionnaires for employees, inspections, and statistical analysis of previous losses to establish premiums for the company. Have an internal Risk Manager sit on your team from your company may be another way to capture financial savings. Through a careful and detailed inspection process the best overall risk assessment can be done. 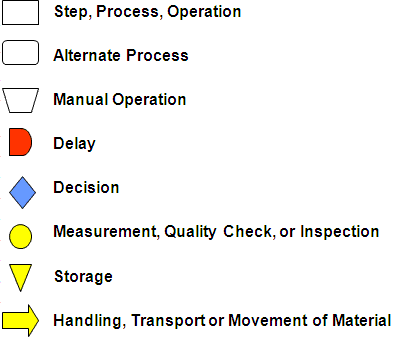 Process Maps can provide a lot of information in an easy to read format. They will be looking for potential problems that are a combination of hazards, perils, and exposures. 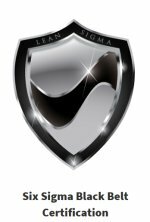 A Six Sigma team may be working to reduce the number of Recordable Injuries and Lost Time Injuries. Some improvements that may be implemented are alarm systems, sprinklers in new areas, facility-wide intercoms, and others that may also qualify your company for reduced property insurance premiums. Theoretically, the perfect state of a value stream or flowchart is to have 100% of the steps adding value. This module provides lessons on how to use different types of process mapping tools to breakdown and understand your business processes. It also gives an insight of how the outputs from this tool can become critical inputs for the more advanced tools you may use through your DMAIC journey. Click here to purchase the Process Mapping module and others that are available. 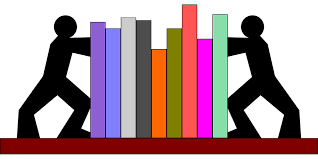 Different sources will use suggest different colors denotations for symbols. The color will help to identify specific steps when looking at very detailed maps. It is important that your teams uses a consistent color scheme. There are hundreds of symbols, some of the most common are shown. Several other visual tools are forms of Process Maps and each has a specific use, is a part of another tool, or is a type of process map. For example, the SIPOC is more than a very high level process map, it defines the Suppliers, Inputs, Outputs, and Customers and its "Process Map" portion is very generic.